Next in the series on The Buffalo Guys, is this Mild variety. See my previous review of their Sweet Peppered. The Buffalo Guys is a brand of The Buffalo Guys, LLC based out of Elk Mountain, WY. The business has been around since 2000, formed through two independent bison ranchers who decided to join together. The Buffalo Guys own their own bison ranch in Kansas. They originally started out as "Nature's Prairie", but as Americans continue to say "buffalo" instead of "bison", they opted to change to "The Buffalo Guys". 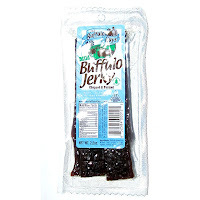 The brand seems to offer only two varieties of buffalo jerky, this Mild, and the Sweet Peppered I reviewed earlier. This Mild is a chopped & formed product, whereas the Sweet Peppered is whole muscle. Buffalo (American Bison), salt, sugar, papaya, spices, honey, garlic powder. The first thing I taste from the surface of these pieces is a light sweet, and light smoky flavor. The chewing texture starts with some natural meat flavors, mixed with some sweet, and then there's some saltiness. Well for being advertised as a "Mild" variety of buffalo jerky, it certainly is mild. Everything from the surface flavors to the chewing flavors, are all light on taste. 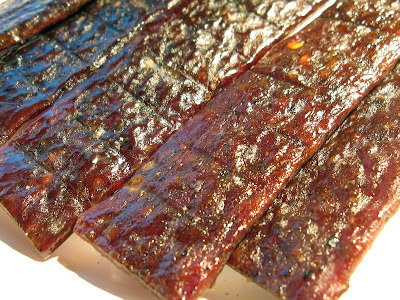 This isn't a jerky that's going to grab your attention, or keep you awake as you drive that long haul through midnight. Unless of course, you have an extremely sensitive palate. The ingredient that seems to provide the most flavor are the natural meat flavors. It has a moderate flavor intensity, largely because there aren't any other ingredients with enough intensity to subdue it. The sweetness continues through the chewing in a light amount as well, and makes up the second strongest flavor. The saltiness is at a light intensity, as is the smokiness. The smokiness is mostly noticed off the surface. I can see tiny flecks of black pepper, but they don't really offer much flavor. The garlic doesn't add much flavor either. Overall, it is in fact a very mild tasting jerky, with a light flavor intensity, largely marked by the natural meat flavors, with some sweetness. 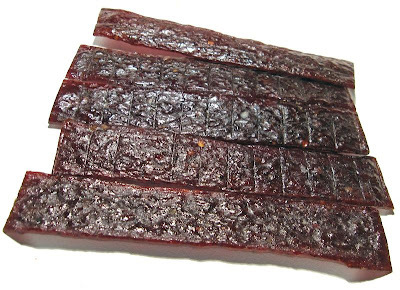 This is a chopped & formed jerky, pressed into strips of about 3/4 inch wide, and about 5-6 inches in length. It has a dry chew, but the surface of these strips are quite oily. Biting off chunks requires a little bit of effort, while chewing is somewhat labored. The chewing texture starts out feeling like hard rubber. The initial chewing reveals some rubbery resistance, and then it starts breaking down quickly and easily. Once chewed down to a soft mass, it's quite crumbly, and not at all steak-like. These strips don't seem to contain any hard bits of bone, but I do find a couple small chewy bits of cartilage or tendon. Handling these strips leaves a good deal of oil on my fingers requiring a licking and wiping on my jeans. I purchased this Sweet Peppered jerky through a sampler package off of The Buffalo Guys website. I got two 3oz packages of this Mild, along with two 2.2oz packages of their Sweet Peppered, for $29.99. Shipping was free. That works out to a per ounce price of $2.88. For general jerky snacking purposes at the $2.88 price per ounce, this seems to provide a weak value. I'm getting a low level of snackability from this due to a satisfactory flavor at best, but the greasiness and crumbly chew subtracts from that pleasure. And the $2.88 price per ounce is quite a bit higher than the mass-market brands at the grocery store, while I'm getting less snackability. As a mild buffalo jerky, at the same $2.88 price per ounce, it's a decent value. It certainly is mild in that it has a light flavor overall and nothing spicy. But it also provides some natural meat flavors, which is what you'd want if you plan to pay the higher price to get buffalo jerky. This Mild variety from The Buffalo Guys definitely provides a mild flavor, to the point where I get only a light flavor overall, and nothing spicy. It's primary flavor are the natural buffalo meat flavors, with some sweetness, a touch of smokiness, and a light bit of saltiness. The meat consistency has little to be desired, having a rubbery, crumbly chewing texture, while the strips leave a lot of grease on my fingers. The fact that I couldn't get much snackability out of this is why I couldn't give it a higher rating. But I'll submit that this jerky is intended for folks who want a very mild tasting jerky, perhaps those who can't handle any amount of spiciness. If that fits your description, you may find a lot more snackability than I did. I think a good beer pairing for this is an IPA. How sad that The Buffalo Guys Mild Buffalo Jerky Chopped and Formed changed it product to the general public. 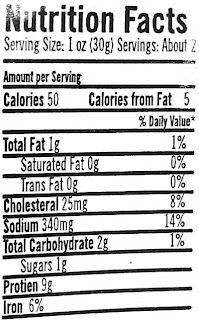 Previously this product sold with 1 gram of fat and 0 saturated fat and now it sells for 4 grams of fat and 1.5 grams of saturated fat. The size went from 2.2 oz to 2 oz. I will no longer for health reasons buy this product due to the change in fat content.